Following the disturbing news and public outcry, last week, regarding the rejection by the Land and Environment Court of NSW for a proposal to build a Synagogue in Bondi because of the potential risk to users and other members of the general due to potential terrorist threats, it is pleasing to know that the Waverley Council seem to have recapitulated and requested of the Synagogue to submit a new development application which will be considered by the Waverley Council afresh on its merits. We are indeed fortunate to live in a Country which has always valued, respected and protected its multi-cultural diversity, and may justice prevail in this instance to maintain a free and safe society for all people to practice their religion. Among the many Mitzvot of which we read this week, is the Mitzvah of Mezuzah, as stipulated in the first and second paragraph of the Shema, only in the second paragraph we are informed of the positive consequences resulting from this Mitzvah, namely, “in order that your days, and the days of your children will be lengthened in the land which I have sworn to your forefathers”. As I often to say to people, ensuring that Kosher Mezuzot are affixed on our homes and buisnesses is the best insurance policy! According to Jewish Law, Mezuzot should be checked twice in seven years, and it is customary to have this done during the month of Elul in the lead-up to Rosh Hashanah. I will be more than happy top assist you with this important Mitzvah if you so wish. Next week will be Shabbat Mevarchim Elul, (Shabbat of blessing for the month of Elul), and in the spirit of enhancing our connection to Hashem during this time of Divine grace, in preparation for Rosh Hashanah, I invite you to join me nextShabbat morning, Parshat Re’eh at 7.30am in the Synagogue for the recital of the book of Tehillim (psams), as is customary among many on Shabbat Mevarchim. According to many, from the 15th of Menachem Av it is appropriate to bless one and other to be inscribed and sealed for a sweet New Year. May you to be inscribed and sealed for a good and sweet new year. A special Kiddush will be held tomorrow, to which everyone is invited, to welcome Cassandra (Nava) and Wayne (Yosef) Meyers and Family and Cha Vah LeVine, who have returned from Sydney where they have celebrated their special Simchot. We wish them much Mazal and Brachah, and may we celebrate many happy occasions together in good health. This Monday will be Tu B’Av (15th of Av), one of the happiest days in the Jewish Calendar, on which many historic events and celebrations took place, many of them relating to marriage and relationships. Of particular significance is the contrast between this happy day, and Tisha B’Av (9th of Av), the saddest day in the Jewish calendar, which fall out in such close proximity. 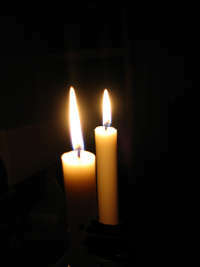 Shabbat Shalom and may we experience the ultimate transformation of all sadness to joy and darkness to light!